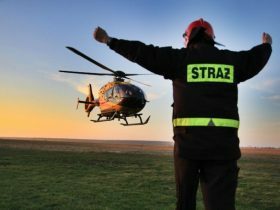 On behalf of the Polish State Helicopter Emergency Medical Services (HEMS) I would like to confirm, that the S4GA company delivered Hybrid Helipad Navigation Lighting for the seasonal HEMS base located in Zegrze Pomorskie (Poland). The HEMS manages 21 permanent and 1 seasonal base. The modern HEMS fleet consists of 27 Eurocopters EC135 and 2 Piaggio P.180 Avanti turboprop planes. S4GA has demonstrated the hybrid lighting system at the HEMS base in Kielce, allowing the HEMS pilots to check the visual range of the lighting units and activate the lighting system using the onboard helicopter radio. The S4GA system was positively rated by the HEMS management and pilots themselves. Why has the HEMS chosen S4GA hybrid system? Due to the fact that seasonal base operates only few months per year, it was important for us to have semi-stationary lighting, which can be quickly and easily dismantled and stored for the time when base is not functioning. The hybrid system provided us with such possibility. At the very beginning we were considering both cable and hybrid systems. Installation cost for a hybrid system turned out to be significantly lower than the conventional (cabled) lighting system. That fact convinced us to choose the hybrid option. The S4GA hybrid system has been successfully installed. 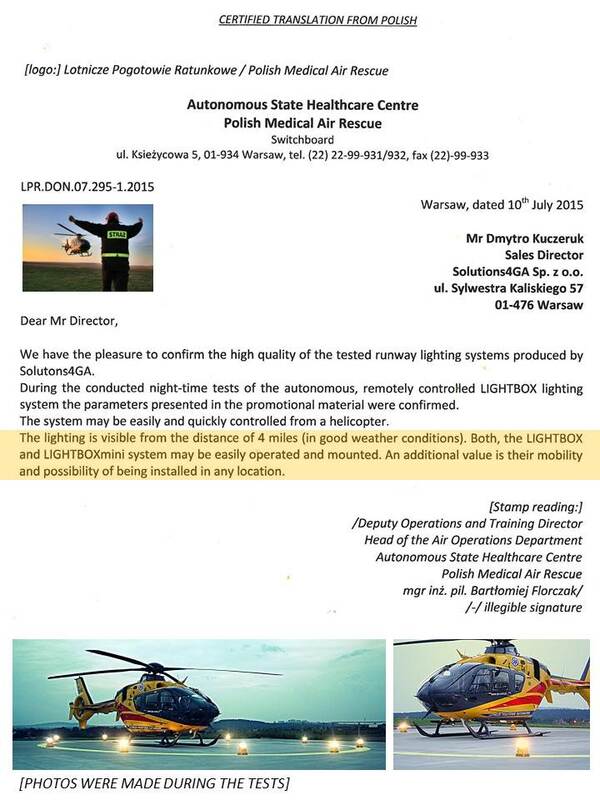 The necessary measurements and helicopter reference flight have been performed, as well as the entry of the lighting system into the Registry of Aviation Ground Equipment maintained by the President of the Polish Civil Aviation Authority is in progress.